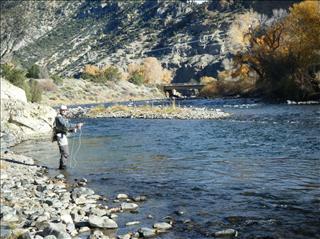 Description: The Club shares this outstanding 1.5-mile lease with the Arkansas River Fly Shop in Salida, and members are asked to check into the shop prior to fishing to receive their beat assignment and a detailed map. Club members have access to two beats on the south (highway) side of the river to midstream. This prime trout water is filled with classic riffles, pocketwater and deep pools. containing wild brown trout with fish ranging from10 to 18 inches. Hybrid Hofer rainbows have been introduced to the river and can run from 14 to 18 inches. The Arkansas is known for incredible hatches starting with blue-winged olives, then the ""blizzard"" of caddis followed by stoneflies, PMDs and terrestrials. Members will enjoy a long wade season. Location: The Club's two beats are located approximately seven miles below Salida between Wellsville and Swissvale.